Enjoy plant power. Mild taste, no sugars. Rich in plant protein. + Calcium & vit. B2, B12, D. 100% plant-based. Easy to digest as naturally lactose free. Naturally low in saturated fat. Free from dairy and gluten. Free from colours. Proterra Certified - Sustainability Non-GMO Soya. Vegan. Nutritious and rich in high-quality soya protein, which contributes to muscle maintenance. Love our new mild taste! 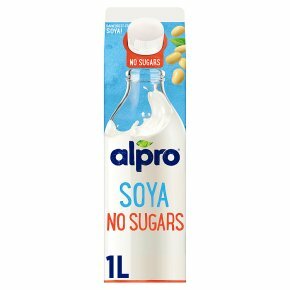 Experience the new taste of soya with Alpro® Soya Unsweetened. Deliciously mild and versatile, it's perfect in your morning coffee, your favourite recipes, or straight from the glass. No sugars. Enjoy soya goodness.